To help you make the most of your trip to Georgia, the Georgia Department of Economic Development has put together the 2014 Georgia Travel Guide. Within the guide, the state is divided into nine regional sections, each packed with useful information on attractions, festivals, events, activities and accommodation throughout the state. Each region features a Visitors Resource section where you will find information on the Convention and Visitors Bureaus, Chambers of Commerce, State Visitor Information Centers and Local Welcome Centers. In the guide, you’ll also notice both a state map (on page 10) and individual regional maps, including state parks and historic sites. You can email us to request your copy or view online. Thank you for your address but we only send to UK & Europe. 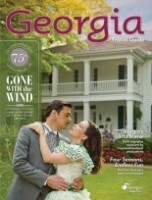 If you visit www.exploregeorgia.org they will be able to send you the latest travel guide.